If you are in the process of planning a garage addition or finishing an existing garage, it is important that you create a diagram showing the location of all of the switches and outlets for electrical service. Whether you are planning to do the finishing and/or wiring yourself, or hiring someone else to do it, planning out the locations beforehand can save you time and energy later on when you find that a particular switch or outlet is not located in a place that is convenient to access. Draw an exact scale outline of your garage on the graph paper. It is a good idea to use a scale of 1/2 inch to 1 foot to ensure that you can fit it on the sheet of paper. Be sure to include all window and door openings and that the openings are the correct size. Mark where each outlet will go on the diagram. It is easier to place the electrical boxes next to wall studs so you have something to nail the box into; otherwise, you will have to attach bracing between the nearest studs to support the box. It is not imperative that you get the exact width of the box correct on the drawing, but if you plan to have the outlet or switch in a place where trim work or molding will go, standard electrical boxes measure 2 1/4 by 3 3/4 inches. Write the height of each outlet or switch, in inches, next to the location marked on the diagram. 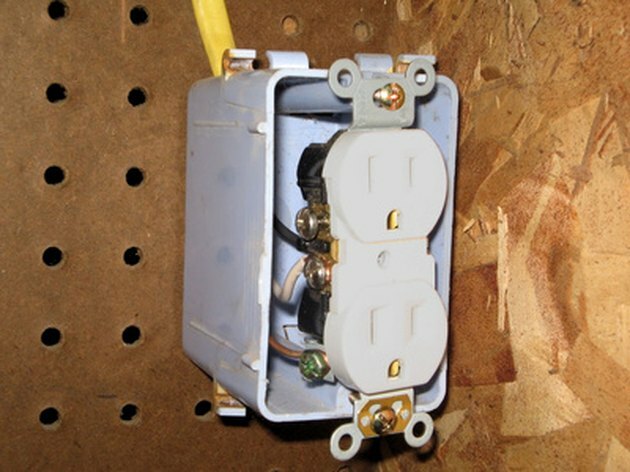 Standard height of the bottom of the box for wall outlets is 10 inches from the floor. With outlet plates on it will appear slightly lower. Standard height of the bottom of the box for wall switches is 48 inches. Mark the location of all electrical and plumbing lines, either existing or proposed, to ensure that there are no conflicts. Indicate somewhere on the diagram what wire gauge you are planning to use. Residential wiring codes vary widely, and it is important that the contractor and/or inspector is aware of what gauge you are planning to use. Rob Billeaud has been in the technical and business writing field since 1996. His work has appeared in print publications and online at BluesforPeace.com, a music interest website promoting peaceful solutions to political and cultural disputes through music. He holds a Bachelor of Arts degree in political science from the University of Louisiana-Lafayette.